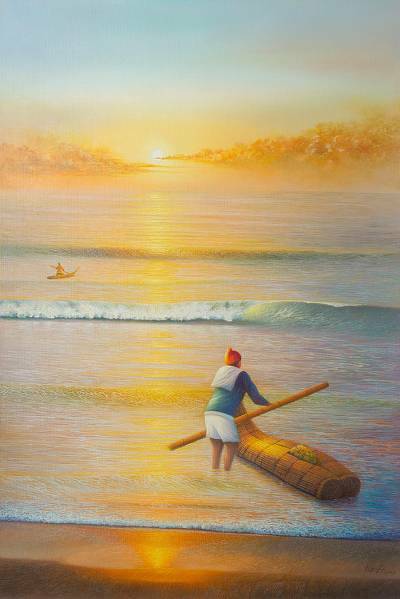 2016 Realist Painting of Fishermen and the Sea from Peru, "Sunset Poem"
Teodoro Reque Liza creates a visual poem to the sunset, painting this calming composition in the realist style to depict a golden sun-kissed seaside. A fisherman in the foreground prepares to set out into the water, while one in the background is already hard at work. Teodoro draws inspiration from his childhood, spending plenty of time at the Santa Rosa beach at the north coast of Peru. Titled Poema del atardecer in Spanish.